The aboriginal peoples of the Upper Ovens, Buffalo and Buckland Rivers were members of the Ya-itma-thang tribal group. They occupied the lower reaches of the river valleys throughout the year. Camps were established on the softer-soil plains of the open flat country where water and food sources were plentiful. Groups visited elevated areas, such as the Buffalo Plateau, during the spring and summer months to harvest the Bogong Moths, roasting and eating them for their high fat content. Millions of moths congregated in rock crevasses and were considered a delicacy. Access to the Buffalo Plateau occurred via the upper reaches of the Buffalo Creek and from Nug Nug on the Buffalo River, along centuries-old walking tracks. The last of the Ya-itma-thang people had died out or had left the district by the early 1880s, seeking refuge in “pastoral protectorates”such as Murchison. Evidence of their presence remains today in two “Big Trees” (one in Smith Street, Myrtleford and the other at the corner of Prince and Myrtle Streets, Myrtleford), the grinding stones and axe heads occasionally found in local creeks and the rock art in granite shelters at Mudgegonga, and by many of the names given to local towns and villages. Top Left - stone upon which seeds were ground. Far right - the "pestle" to grind the seeds. 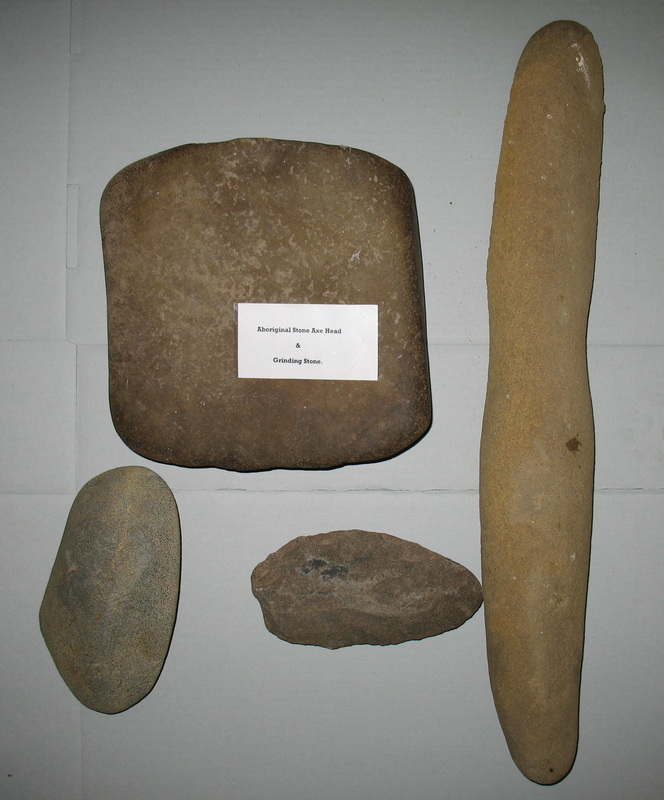 Bottom left - stone used for chopping (bones & meat probably). Middle bottom - sharpened stone for cutting.